Heythrop Park Resort is a unique venue plotted amid 440 acres of stunning Oxfordshire countryside. 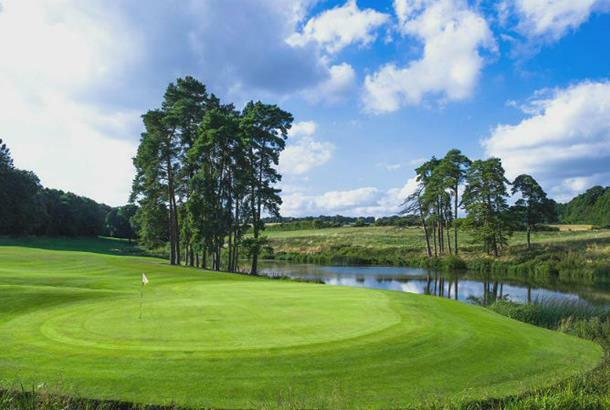 Dating back to 1710 this quintessential English country estate combines elegance with style and boasts two individual hotels - the DeVere Venues Heythrop Park and the Crowne Plaza Hotels – plus a championship standard golf course, health club & spa and several dining options. The splendid Tom Mackenzie layout is maturing fast and was in excellent condition during our early-season visit. It features a string of memorable holes, including cracking back-to-back short par-4s (5th and 6th) on the front nine. But the reverse nine is even stronger, the par-5 11th being stroke index 1 and played from a tee in front of the striking early 18th century mansion house, now a hotel, to a green lurking to the left of a large pond, which becomes an ice rink in winter. Highlight though is the 13th, a stunning par-3 played from an elevated tee in the woods to a green perched beyond a pond. New Director of Golf Tim Good is determined to put Heythrop Park on the map, pledging to raise its profile and seal its place among the country’s leading golf resorts. Things are looking a lot brighter off-course too. We stayed in a refurbished wing of the DeVere Venues hotel and the room was both smart and stylish. Plus it was convenient for the complimentary refreshments facility, complete with large screen TV, just down the corridor. There’s a variety of dining options including the popular Terrace Restaurant with its impressive views overlooking the South Lawns and golf course, supported by a splendid spa complete with 20metre pool – part of the clubhouse facilities at the far end of the complex. The so-called sleeping giant is waking from its slumber. 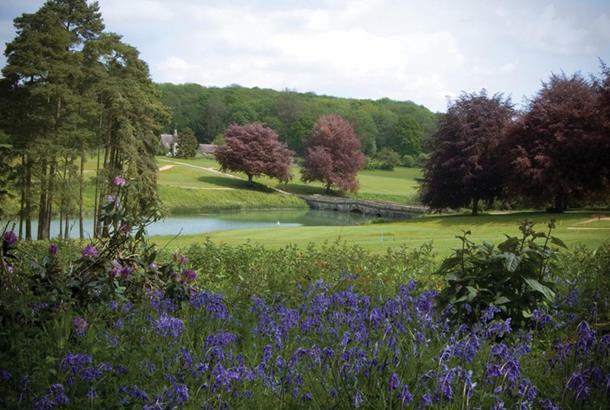 The Bainbridge Course at Heythrop Park was redesigned in 2009 by Tom MacKenzie the golf course architect responsible for many Open Championship venues. The 7088 yard par 72 course weaves throughout the 440 acre Heythrop estate and provides the perfect challenge for all golfers. Located 12 miles north of Oxford just outside Chipping Norton in the Cotswolds, Heythrop Park is within 90 minutes drive time of London and the Midlands, making us very accessible indeed.the Bainbridge Course at Heythrop Park was redesigned in 2009 by Tom MacKenzie the golf course architect responsible for many Open Championship venues. The 7088 yard par 72 course weaves throughout the 440 acre Heythrop estate and provides the perfect challenge for all golfers. Green Fees Mon-Thurs: £40, £25 twilight after 3pm; Fri-Sun: £30 twilight after 4pm. The course description above may have been relevant in 2009 but the current course bears no resemblance to the description now. Played the course at the end of June with 16 members as a society package bacon bap on arrival, 27 holes of golf light lunch and evening meal. The course was in poor condition, greens left a lot to be desired,edge of the bunkers uncut, inconsistant sand, tee off area bear. The shared club house with spa area had no means of dealing with 16 society members for light lunch or for an evening meal, we had to serve ourselves, request cutlery, condements and we're all sat seperately some even had to eat the food on thier laps As a well established society we've played over 70 courses within an hours drive of Swindon this is the worse society day out we've ever had, over rated, over priced, we'll noy be going backl . I played Heythrop Park today after attending a conference at the hotel yesterday and was blown away with it. The estate itself is quite impressive but nothing could prepare us for the golf course... Luckily the sun was shining and this just helped show what a great course this will be. It is beautifully designed with super bunkering. The first few holes are good but then you walk through a wood to get to the 5th and then it really starts... Some truly memorable holes follow one after the other with the highlight being the 11th and 13th. I was amazed at how the course had drained considering the weather we have had. The last few holes need a bit more rough but whe you finish off with the 18th in front of the house it makes it all worthwhile. I recommend this to all those that want to experience a new course that feels that its been there for ages. I would also recommend a trolley as its a good walk!! !